Kabale und Hiebe caused some controversial discussions in our group. Some - like Moritz - like the game a lot, while others - like Walter - do not like it too much. In order to reflect this controversy, we are publishing two reviews of the game, this one by Moritz and a second one by Walter. “Kabale und Hiebe” is a difficult to translate title, as it refers to a famous play by German classic author Schiller called “Kabale und Liebe”, which translates to “Intrigue and Love”. By changing the first letter of the word “Liebe” to “h” it becomes “Hiebe”, though, and that means “Slashes” instead of love. Therefore the correct English translation of this title would be “Intrigue and Slashes”. Sounds funny to you? Well, that’s the magic of German humour for you. 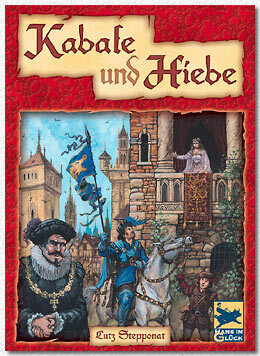 “Kabale und Hiebe” is a very humorous game, though, and – unusual for a game from “Hans im Glueck”, it has a clear fantasy theme. No wonder, as the designer Lutz Stepponat is known for his richly themed fantasy games like “Return of the Heroes”. Currently Stepponat is working on a more complex fantasy game called “Midgard”, based on the German role-playing game of the same name. But I digress – “Kabale und Hiebe” might be one of the German games influenced by American games, not the other way round as is more common. In fact we were all reminded during our first game of the old Fantasy Flight game “Orcz”, where players place hidden orc units under scoring cards which then proceed to fight each other with special abilities. 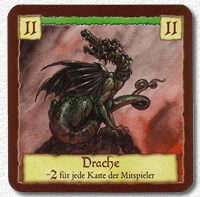 In “Kabale und Hiebe” there is an even wider array of special character cards that one can place under various scoring cards, which then...well proceed to fight each other with special abilities. “Kabale und Hiebe” now gives us a huge noodle-soup of theme along with chopsticks. You see, each player has the same huge stack of character cards, each with unique special abilities. Basically each card has a strength number, and is placed secretly under one of several scoring cards that depend on the number of players. Each of these scoring cards also has a “limit” which says how many cards can be played under it. Although one can also continue to play character cards under scoring cards that have already reached their limit, the actual round ends when all scoring cards have reached the limit, a little like the end of the round in “Titan – The Arena”. Now all cards are uncovered and the player who has the highest score from his characters gets the scoring card, and another round begins, until the scoring cards run out and the highest sum of victory points wins. So far so good – but I have already mentioned that theme and special abilities come aplenty here. You see: the first character under a scoring card is played secretly, but the second character who comes along uncovers the one played before him, a little like in “Orcz”. Beautiful Cards with buxom women: check! Now this triggers or uncovers the special ability of that former character. It could be an assassin who kills the newcomer, or it could be an explorer who goes on a journey to the next scoring card, or it could be a witch who kills weak characters or a Wizard who kills strong characters. There is Romeo and Juliet who alone score weakly, but together they have quite a punch. There is the small giant who gets stronger the more cards are played in a row. And there are many, many more, you get the drift. In fact it can happen that rows of cards become quite long, because no player wants to end the round, and working through them can become quite confusing as one has to check out what effects come first, and which ones second. The rules are, fortunately, pretty clear on these issues – IF you can get a German translation that is correct. This sounds like and also IS chaotic, but in a light and fun way. Having only 3 cards to choose from each round keeps brain activity and downtime under control, and the game ends fairly quickly. As each player has the same set of characters card-counting could be a tactic, but only for advanced players. I personally think that this game should rather be played as light fare, not too heavy on the thinking and letting some luck happen. It still is by all means a far cry from the awful “Munchkin” line of games, where no tactic works, in “Kabale und Hiebe” skillful card play will be rewarded, just don’t expect that every tactic will work in a game with basically hidden cards. I found “Kabale und Hiebe” much more enjoyable than Hans im Glueck’s other offering this year, “Taluva”, and the graphic presentation is – as usual – absolutely outstanding. “Kabale und Hiebe” has been a little overlooked this Essen by many, but it is in fact a wonderful, light game, and a new direction for “Hans-im-Glueck”, probably closest to what they tried to do in “Citadels”.